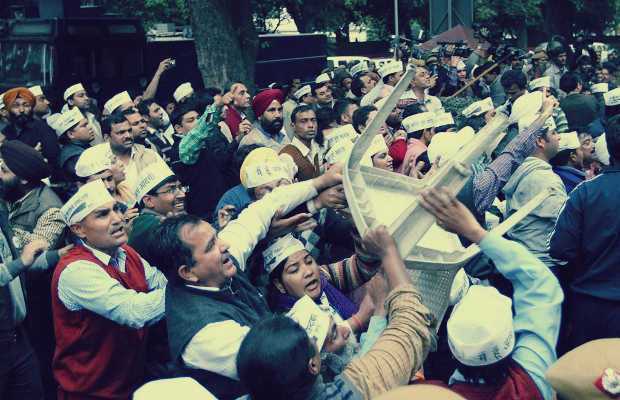 Is AAP responsible for rising intolerance in MBA GDs in India? Come February as results of various entrance exams flood our consciousness voices rise, opinions are slammed everywhere and virtues of national integration and brotherhood on which our forefathers had written the constitution are forgotten. The difference of opinion though are not on the entrance marks, surprisingly everyone though is shocked or disgusted with their marks, the only person they seem to be blaming is either themselves or some non descript theory in mathematics (Hint it contains the word normal and is totally unreliable making people doubt if it is a theory of mathematics or of social studies. )Unlike in school where ‘A’ would rush to teacher shouting ‘The world is unfair’ if ‘B’ had scored two marks more than him in a question he had copied from ‘B’, people don’t compare marks. Instead everyone is fighting on obscure unrelated issues ranging from ‘Is fundamental Shia-Sunni Conflict fueling the civil war in Syria’ to ‘Are policies of world bank responsible for stunting growth in emerging economies.’ and seem to care about them in a weird phony sense in what is called group discussion (GD). Group discussions is actually the most reliable of communication weapons for it even brings out opinions from shiest of beings.Anonymous keyboard warriors with opinions varying from ‘Himmatwala is the worst movie ever ‘ to ‘Nobody in India can be both rich and educated because of Congress’ have to blurt these opinions in open and suddenly these opinions have a face. Group discussions this year though have undergone a landmark change because of something historic that happened in December of 2013, the government of Aam Aadmi Party(AAP) coming to power and the subsequent things that have followed all of which come under the umbrella of AAP effect. AAP effect is defined in many ways. In some cases it is the state of limbo one comes into after being the leader of a government, then in opposition to it in circum continuity over a period of 49 days and finally reaching a certain point where the leader is unsure of his exact position and goes on to run an anarchic government against his own government. It is also defined in economic terms as the factor by which your economy is screwed after doling out free water, electricity and a sense of righteousness to everyone even when none of it exists. In a positive way it can also be defined as the constant which defines the relationship between the humongous losses faced by the underground bribery economy which in turn is proportional to the magnanimous profits for the industry manufacturing stealth surveillance equipment. For a naysayer apolitical MBA aspirant whose sole purpose in life to save the iota of self respect he has and get into a college whose name at least people know, the AAP effect can have disastrous consequences on the 1:6 chances he had calculated for himself. It can also give him an impression about his youth being wasted. All of the above though seems to have gone for a toss, because of course who cares about a seat in some illustrious management college when there is an election and the future of the country at stake, we could always give CAT next year and this is basically how a closet AAP supporter, overt MBA aspirant thinks. He would probably be one of those in the last years of undergraduate college or a recently graduated fresher and having all these whims and notions about how he is going to change the world. The truth hits him like an iron anvil after three cat attempts. The effect of the ideology on him in initial years though remains steadfast. He is the one who has been begrudged for not making it to IIT, has seen teacher’s pets get more internal marks during science practicals, has found a sudden sense of entitlement and pathos by working in social service camps one Sunday, has been sick to death hearing about the scams, has paid huge taxes on cigarettes and paid huge money for romance propaganda movies like ‘I hate Love stories’ masked as a date. AAP for him has been a breath of fresh air, a common platform to air grievances and shout against them without finding a solution. An outlet to channel rage from Rediff message boards and he tends to go overboard with them in GDs. His answers and contribution to any topic revolve in and around ‘Youth’, ‘Kejriwal’, ‘Corruption’ and ’Changing the system’. He speaks about them with earnestness, half expecting even you to abandon the GD and leave with him to make a difference to the society but frighteningly he cannot take no for an answer and cannot tolerate a difference of opinion. Taking a different opinion would mean listening to a long lecture about righteousness and being anti poor and selfish. The veteran MBA aspirant bedazzled by these strong stands only hopes to somehow stick to a middle ground to get through the next round without being labeled an ‘Ambani agent’ and not having to repeat the process next year when these closet supporters might be stronger and with a bigger sense of righteousness. This story is by an anonymous writer on InsideIIM. The writer’s previous stories can be read here.